This maheswari cotton silk saree has graceful white coloured body with attractive interwoven strips, plain white and ash shades with broad black inner border and zari golden bottom border. White body of the saree with attractive narrow interwoven strips, plain white and ash shades matches with the borders and pallu. The broad black inner border at the bottom along with the zari golden coloured bottom border and the narrow black upper border match well with the elegant white body of the saree. 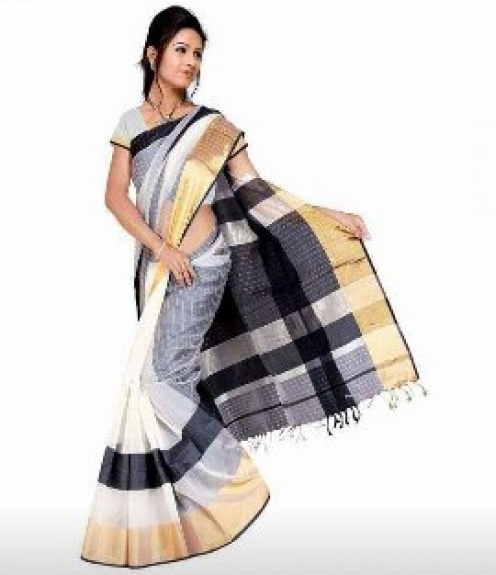 The attractive black and white pallu is adorned with interwoven horizontal strips and the rich golden zari coloured border runs across the pallu. This saree has matching blouse piece in shaded white that is running along the saree. Wear light contemporary jewellery to cross match perfectly with this stylish white saree. The natural cotton and silk fabric and pure vegetable colours add a unique luster to this traditional saree. This elegant white coloured saree with beautiful contrasting shades of white and black with suiting zari gold border along with a graceful pallu, suits casual as well as office wear.